Georgia native Kyle McCann, the catcher for the Jackets baseball team, is playing phenomenally this season as one of the country’s best college players. According to D1Baseball.com’s power rankings, he is currently the second best catcher in the NCAA. McCann earned All-ACC Third Team honors last season, so his success this season is not without precedent. Still, his improvement and performance thus far in 2019 has captured the attention of not only Tech fans, but major league teams as well. McCann’s batting ability stands out as the defining aspect of his game. Currently boasting a slashline of .346/.507/.779, he has drastically improved from his already impressive .300/.423/.600 line of last year. McCann leads the team in total bases (81), doubles (9), and home runs (12), recording twice the amount of home runs as the next highest player on the team — in a potent Tech offense, McCann’s offensive prowess stands out. McCann also leads Tech in runs batted in (37) and games played/started (29). Making big plays is important, but dependably hitting the ball, avoiding outs and earning runs for the team is perhaps even more important. McCann’s rare combination of consistency and power makes him a top-tier batter and an invaluable asset to the Jackets. On the flip side, McCann’s position as catcher means he has a direct relationship with each pitcher on the roster. Although not directly apparent to spectators during the game, his role as catcher is very important to the team’s defensive success. The catcher manages the game, keeping track of strengths and weaknesses of whichever pitcher is on the mound and recommending pitches accordingly to get the current batter out. With six different pitchers having started at least one game this season, the amount of work and skill that McCann needs to excel at the position is impressive. The fact that he is able to balance the demands of being a catcher with his focus on batting, though, is even more impressive. McCann’s exceptional play this season is one of many contributors to the Jacket’s success as a whole. Coming off a resounding victory against No. 15 Auburn, Tech has now amassed five wins against top-15 teams and sits at the number two spot in the ACC Coastal behind NC State, their next match up this coming weekend. The team has clearly shown potential for competing at the highest level with its triumphs over top-ranked teams such as Georgia. Kyle McCann’s continued excellence on the field is necessary for the Jackets to realize that potential down the stretch and into the ACC Championship in late May. 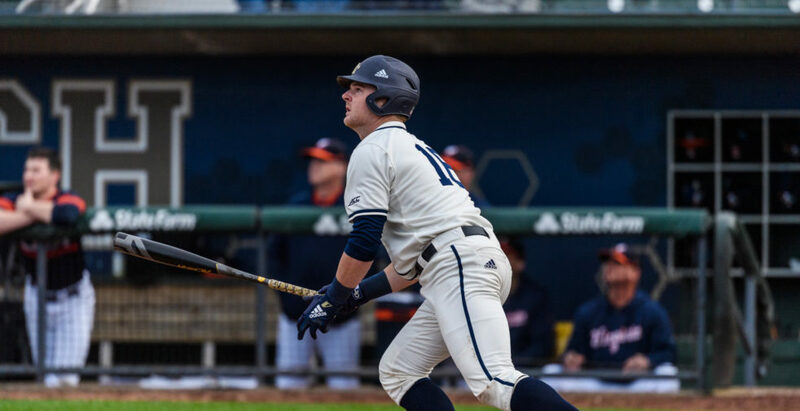 McCann’s torrid pace at the plate has not only drawn attention for the impact it might have on Tech’s ACC standing, however — as a junior, McCann is eligible to be drafted by a major league team this June, and his stock has skyrocketed thanks to his performance. Multiple MLB scouts were in attendance at Tech’s midweek game against UGA late last month, and while McCann only went 0-2 with two walks against the Bulldogs, his stock has remained strong. FanGraphs.com rates McCann as the 96th overall prospect for the 2019 June Amateur draft, noting his “big power bat” but also cautioning that “most scouts thing he’s a first baseman long term”. Still, if McCann can stick behind the plate, it could make him the latest in a long line of Tech catchers to find success on draft day. Tech has graduated All-Star catchers like Jason Varitek and Matt Wieters, and McCann’s predecessor at his position, Joey Bart, was taken No. 2 overall in last year’s draft by the San Francisco Giants. McCann’s sterling performance has carried on the legacy of some of Tech baseball’s legends. But the focus for McCann still lies on the field, not on draft day. Despite Tech’s exemplary performance to date, in the crowded and talented ACC field, anything can happen. For McCann, the cornerstone of Tech’s lineup, to help his team to the postseason means he must keep on keeping on.